The seventies were the Golden Ages for Agatha Christie novels being translated into movies for the big screen. Sure, one can argue that there were many versions of her novels or stories already, like 10 Little Indians, which had already been done many times, and with different titles. The 80’s and 90’s would also see her character Jessica Fletcher, in the form of the inimitable Angela Lansbury in Murder She Wrote, which would become a strong ratings bonanza at CBS for a while. What caused the initial re-interest in all things Christie was the juggernaut, all-star cast, version of Murder On The Orient Express in 1974. This was especially true with Hercule Poirot (the most famous and long-lived Christie character, appearing in 33 novels, one play, and more than 50 short stories published between 1920 and 1975). Despite being a huge box office hit, Albert Finney assayed the character with a decidedly pragmatic British bent that did not jibe well with most Christie fans. Following Finney’s somewhat controversial turn as Poirot, Peter Ustinov took over the roll in a series of films. He was regarded as one of the best Poirots and certainly one of the most likable, as he brought warmth and humor to the character. Years later, while Lansbury was raking it on CBS, David Suchet would hit it big as Hercule Poirot on PBS. He would star in a hit weekly series as well as several made-for TV movie events. These events included, yet another version of Murder on the Orient Express, which would also be paired with a delightful documentary/travelogue with Suchet actually traveling on the modern Orient Express. Murder on the Orient Express has also had other adaptations, including a 2001 TV-Movie co-starring Peter Strauss with Alfred Molina as Poirot, but, we won’t consider this one, despite Molina. I haven’t seen it, but it’s a modernized version, and it was not successful. Now comes Kenneth Branaugh with yet another assessment of the famous detective and yet another version of Murder on the Orient Express with another all-star cast. 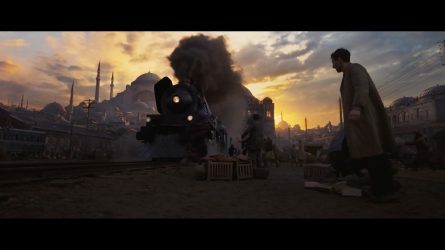 Why remake Murder on the Orient Express? I have read the novel. I have also seen the 1974 Oscar Winning Murder on the Orient Express, and I have seen the David Suchet version. 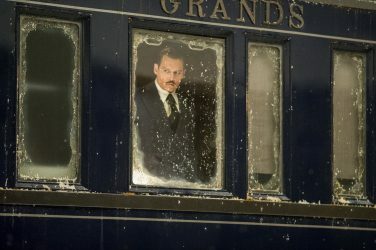 Murder on the Orient Express cannot end any other way than it does. It included one of the most iconic and recognizable endings in all of Christie’s work and Murder on the Orient Express had been copied and parodied numerous times. Also, note that Poirot had already been played by at least 3 different, excellent, actors on screen and even one (John Moffatt) on the radio. They are wrong and stupid. Yes, I said it. Stupid as a jack hammer in a lily field. What the general public calls “boring”, are actually exquisitely calibrated shots with little dialogue where you learn so much from the subtle shifts of the camera as it focuses and refocuses between characters. There are also great, lovely tracking shots through the train, and outside looking in shots through windows while the characters interacted. Plus there was a damn good, introspective Poirot from Branagh. What some call “slack paced”, I call breathing space. Letting us get to know the characters before the mystery unravels. I loved the little, introductory, and humorous scene that introduced Poirot. I don’t remember it being in the novel (maybe it was), but it is a good introduction and very clever. As for “sleep inducing”: I have fallen asleep on even big action movies before. The night I saw Murder on the Orient Expresss I was already somewhat tired as I had just DJ’d a wedding ceremony where there was a difficult, very physical, strike of the equipment. I had also just seen Thor: Ragnarok THAT very night right before. (and yes, I loved it) Orient Express, despite knowing how it was going to end, kept me enthralled and awake from start to finish. One of the weirdest complaints from some, that I would like to address, is Branagh’s mustache. In the original novel the mustache is described EXACTLY as in the new movie. So there. Neener neener! Another odd complaint that I saw on Rotten Tomatoes was that the film is “not funny enough.” Not only is there plenty of humor and wit throughout the film, but, I’m sorry, if you wanted a comedy, Bad Moms 2 is next door, chucklehead. 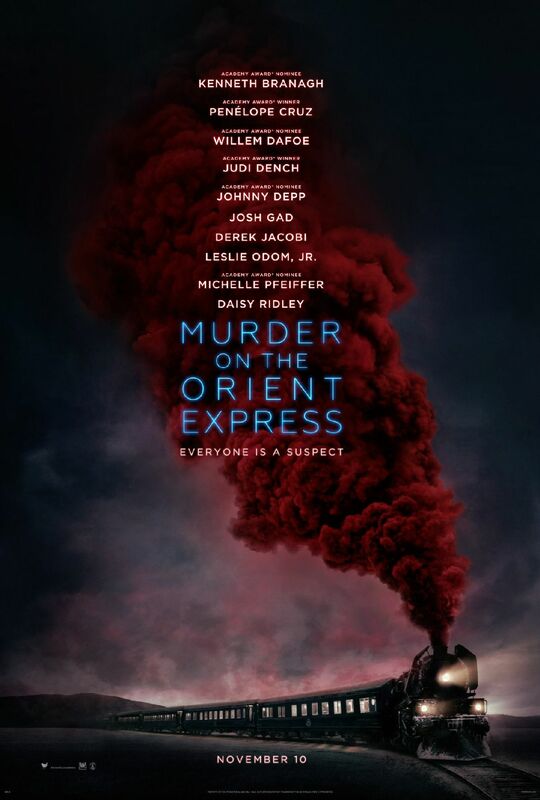 The new Murder on the Orient Express has a great cast, lush cinematography, and even a bonus of Michelle Pfeiffer singing on the credits. 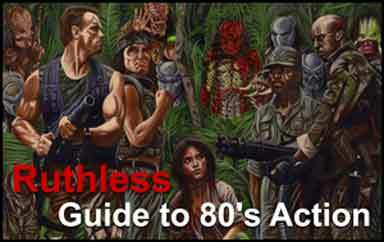 With the exclusion of the two baffling action sequences this is the kind of movie that some folks would say “they don’t make anymore.” They would be right. They don’t make them like this anymore because most folks won’t see movies like the way they used to make them. This is a shame. As much as I enjoy bubble gum action movies like Thor: Ragnarok, there should be room for both.